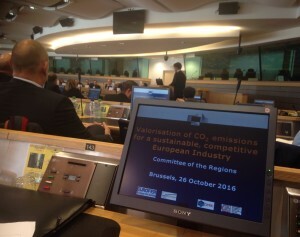 BRUSSELS –On 26 October 2016 Bellona attended the “Valorisation of carbon emissions for a sustainable, competitive European industry” on the usage of captured CO2 post-combustion (Carbon Capture and Usage, CCU). Here, Bellona delivered a clear message to a high level audience: CCU is not an adequate avenue to reach the climate targets of the Paris Agreement. Industries are pushing to have CCU recognised as being a renewable technology. This could have devastating consequences for the probability that the targets in the Paris Agreement will be reached. On 26 October 2016 Bellona Europa attended the “Valorisation of carbon emissions for a sustainable, competitive European industry” on the usage of captured CO2 post-combustion (Carbon Capture and Usage, CCU). Here, Bellona Europa delivered a clear message to a high level audience: CCU is not an adequate avenue to reach the climate targets of the Paris Agreement. Industries are pushing to have CCU recognised as being a renewable technology. This could have devastating consequences for the probability that the targets in the Paris Agreement will be reached. Bellona also used this opportunity to launch a new policy brief highlighting the risks of including CCU as a whole in the Emissions Trading System (ETS) and the Renewable Energy Directive (RED) of the EU, and the threats of diverting investments from more effective and permanent methods of cutting CO2 emissions, such as Carbon Capture and Storage (CCS). Read more about the dangers of including CCU into the new RED here. The conference was organised by Policy Officer of DG ENER of the European Commission Kyriakos Maniatis, in collaboration with the industrial associations Cefic and EUROFER, and the consulting firm ESTEP. Speakers from representatives of the steel, chemical, and cement sectors highlighted the value of CO2 in the manufacturing of various types of products. Although certain types of CCU permanently lock in CO2, preventing it from entering the atmosphere, other types (i.e. synthetic fuels produced with captured industrial CO2 and hydrogen) only delay its emission. Those CCU that merely delays CO2 emission should not receive the status of “renewable” as it does not have the interests of the Paris Agreement as its point of departure, but the interests of industries. The overarching message of this workshop was that the political demand to significantly lower CO2 emissions should not only leave industries unharmed, but should in fact enable the revival of European industry. This is a message Bellona strongly supports, but to our disappointment, the prevention of global climate change remained on the margins of the discussion. Speakers claimed CCS is no longer an option, bio-CCS is entirely unrealistic, and that CCU is the only viable option to lower CO2 emissions adequately. ‘While such misleading statements on the feasibility of CCS are being made, Norway is already taking concrete steps towards commercialising the technology, thus paving the way for EU-wide deployment’ comments Johan Verbeek Wolthuys, Policy Assistant at Bellona Europa, who represented Bellona at the event. See here for more information on Norway’s recently approved CCS projects. Opening the seminar, the message of Marie Donnelly (Directorate-General for Energy, European Commission) stated that CCU will be an important element in the new Renewables Directive of the EU, which is set to be published on 30 November 2016. However, rebranding the production and usage of synthetic fossil fuels as being a renewable solution to reach the necessary climate goals of Paris, and including it in the ETS and RED, will undermine genuine climate solutions and will only benefit industries. During this event, multiple speakers expressed largely profit-driven views which did not have the Paris Agreement as a point of departure. Koen Coppenholle (Cembureau) and Marco Mensink (Cefic), for instance, argued that the producers of CO2, who sell the CO2 for reuse by other actors, should not have to relinquish their CO2 allowances within the ETS framework, even if the CO2 is eventually disposed of in the atmosphere. However, if the CO2 is produced by a sector within the ETS, and emitted by a sector outside of it, the CO2 will not be accounted for and is effectively laundered. Jan Theulen (HeidelbergCement) shared more constructive comments when he underlined that CCS is required for a full decarbonisation of the cement industry, and that that CCS was not merely, as Mensink stated, “a hype in 2009”. Hans-Jörn Weddige (ThyssenKrupp) presented the steel industry’s views on the opportunities and challenges for CCU. One of the key points made was that reusing CO2 to produce synthetic fuel, for instance, contributes to establishing a circular CO2 economy. Bellona Europa’s Verbeek Wolthuys challenged this statement by questioning the “circularity” of such a system, in which new carbon is continuously introduced and CO2 is emitted. A recurring theme during this conference was the concept of “avoided CO2 emissions”. Synthetic fuels produced by adding renewable hydrogen to captured industrial CO2 are said to substitute the need to use fossil fuels. The hypothetically avoided emission of CO2 in this process is regarded, by many of the sectors represented at the event, as the reason synthetic fuels should be considered ‘renewable’. Carl de Maré (ArcelorMittal) even compared vehicles using such fuels to electric vehicles. “Synthetic car fuel”, he said, “can avoid fossil fuel that is equivalent to having 100.000 on the road.” The fact that the combustion of synthetic fuel emits CO2 regardless of the reuse of industrial CO2 was not given much attention. Calling synthetic fuels based on fossil CO2 from industry “renewable” and pushing for their acknowledgement in the new RED will amount to subsidised fossil fuels that will directly compete with actual renewable energy in the transport sector. Moreover, this will essentially lock society in with massive emissions in the transport sector that cannot easily be dealt with, rendering the Paris Agreement unattainable. This entails a massively wasteful, inefficient value chain draining renewable electricity which could be used for electro-mobility directly. Carlo Pettinelli (Directorate-General for Internal Market, Industry, Entrepreneurship and SMEs of the European Commission, DG GROW) made the claim that CCS is not viable due to the lack of geological storage space. This directly contradicts studies such as those conducted by experts like James J. Dooley, which show that “a ‘lack’ of deep geologic CO2 storage capacity is unlikely to be an impediment for the commercial adoption of CCS technologies in this century”. Pettinelli’s statement demonstrates the unwillingness of DG GROW to accept CCS as an essential and effective tool to cut CO2 emissions based on misconceptions. “The non-permanent CO2 storage properties of certain types of CCU make the wholesale inclusion of CCU into the ETS Directive a threat to the effectiveness and integrity of the ETS itself. Instead of investing in a tool for CO2 laundering, investments ought to be made into developing storage and rolling out infrastructure to enable CCS” argues Bellona’s Verbeek Wolthuys.